For more than two years shuttle bus driver Michael Wilcox has transported tens of thousands of visitors from the museum to its sister institution, Shangri La Museum of Islamic Art, Culture & Design. In February his position shifted into overdrive, when the museum started offering tours that spanned both its Beretania Street and Makiki Heights campuses. After graduating from Roosevelt High School, Wilcox earned a degree in Computer Science from Kapi‘olani Community College. Before driving for the museum, he worked on everything from go-karts to semi-trucks, and even an aircraft pushback tractor. 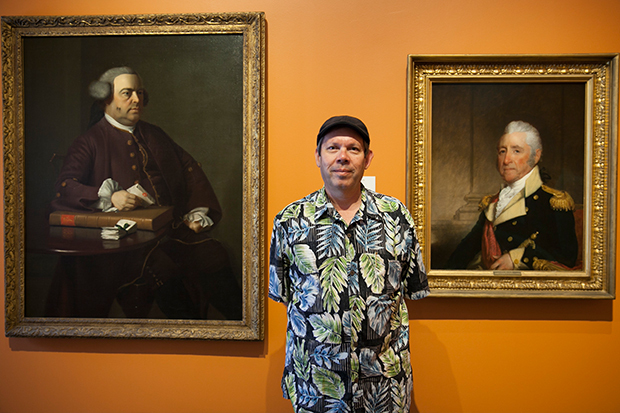 We asked Wilcox about his favorite works in the collection, and he explained how a pair of portraits makes him think about what it must have been like in the early days of our nation, and what the founding fathers might think about where we are today. Interested in visiting Shangri La? We recommend booking at least two or three weeks in advance. Find the next available tour here.